Here’s a look at some of the states using commissions or other nontraditional methods for the next round of redistricting, after the 2020 Census. ALASKA — A five-member commission draws districts for the state House and Senate under a 1998 amendment to the state constitution. Two members are appointed by the governor and one each by the presiding officers of the House and Senate and the chief justice of the Supreme Court. Districts must be compact, contiguous and contain “a relatively integrated socio-economic area.” Alaska has only one congressional district. 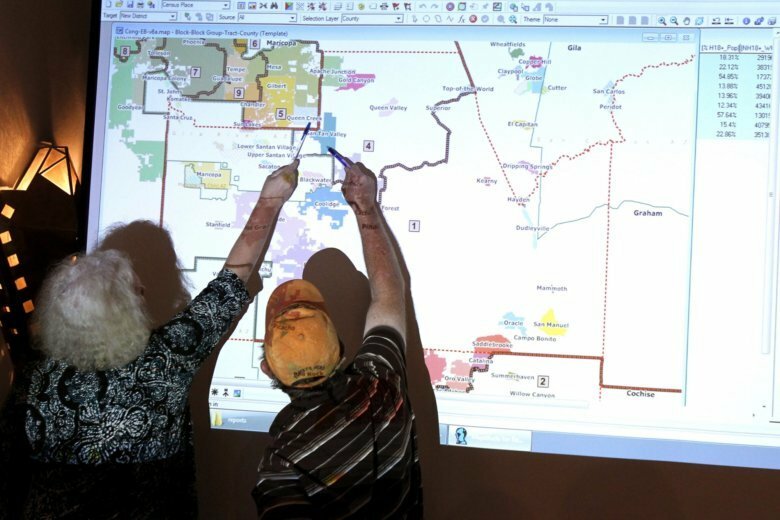 ARIZONA — Congressional and state legislative districts are drawn by a five-member commission established under a ballot measure approved by voters in 2000. Twenty-five potential redistricting commissioners are nominated by the same state panel that handles appeals court nominees. The Legislature’s two Republican leaders choose two commissioners from 10 Republican candidates, and the two Democratic leaders chose two from their party’s 10 nominees. Those four commissioners then select the fifth member, who must be an independent and serves as panel chairman. The constitution says “competitive districts” should be drawn so long as that doesn’t detract from the goals of having compact, contiguous districts that respect communities of interest. CALIFORNIA — Voters approved a pair of ballot measures, in 2008 and 2010, creating a 14-person commission to draw congressional and state legislative districts. A state auditor’s panel takes applications and selects 60 potential redistricting commissioners — 20 Democrats, 20 Republicans and 20 others. The state Assembly and Senate majority and minority leaders each can eliminate two nominees from each political category. Eight redistricting commissioners — three Democrats, three Republicans and two unaffiliated members — are randomly selected from the remaining pool of candidates. Those commissioners then select an additional two Democrats, two Republicans and two unaffiliated members. Approving a map requires nine votes, including three from each political category of members. The constitution says the districts should be compact and keep cities, counties and communities of interest in tact to the extent possible. IOWA — The nonpartisan Legislative Services Agency draws maps for congressional and state legislative districts, which are submitted to the Legislature for approval. Districts must consist of “convenient contiguous territory” and be reasonably compact. Districts cannot be drawn to favor a political party, incumbent or other person or group. MICHGIAN —Under a constitutional amendment approved by voters last November, congressional and state legislative districts will be drawn by a 13-member citizens’ commission. It will consist of four Democrats, four Republicans and five independents randomly selected by the secretary of state from among applicants. Approval of districts will require a majority vote with support of at least two Democrats, two Republicans and two independents. If that fails, each commissioner would submit a plan and rank their options by preference, with the highest-ranked plan prevailing. In case of a tie, the secretary of state would randomly select the final plan. Districts must be compact, contiguous, limit splitting of counties and cities, “reflect the state’s diverse population and communities of interest,” not favor or disfavor incumbents, and not provide a disproportionate advantage to any political party. MISSOURI — A constitutional amendment approved by voters last November will require a new nonpartisan state demographer to draft maps for state House and Senate districts. The demographer is to design districts to achieve “partisan fairness” and “competitiveness” as determined by statistical measurements using the results of previous elections. Districts also shall be contiguous and limit splits among counties and cities. Compact districts are preferred but rank last among the criteria. The maps will be submitted to a pair of existing bipartisan commissions for approval. The governor will appoint a 10-member commission for the Senate districts, choosing five Republicans and five Democrats from among nominees submitted by the state parties. For the House, the governor will appoint an equal bipartisan commission of 16 members from nominees submitted by Republican and Democratic congressional district committees. Congressional districts still will be drawn by the state Legislature. MONTANA — A five-person commission draws state legislative districts and would also draw congressional districts if Montana’s population grows enough to have more than one. The majority and minority leaders of each legislative chamber appoint one member each. Those four then select a fifth member, who serves as chairman. Districts must be compact and contiguous. NEW JERSEY — Congressional districts are drawn by a 13-member commission, which requires a majority vote to approve a map. The majority and minority leaders of each legislative chamber and the chairmen of the state’s two major parties each appoint two members. Those 12 select one more member. A separate 10-member commission draws state legislative districts, with the chairmen of the two major political parties each appointing five members. If they can’t agree on a plan, the Supreme Court appoints an 11th member. State legislative districts must be contiguous and as compact as possible. NEW YORK – Under a constitutional amendment approved by voters in 2014, a 10-member commission will draft districts for both Congress and the state Legislature. The majority and minority leaders of each chamber each appoint two members to the commission. Those eight members then select the other two commissioners. Their maps are submitted to the Legislature for approval. Districts shall be compact and contiguous and shall not be drawn to discourage competition or to favor incumbents, particular candidates or political parties. UTAH — Congressional and state legislative districts will be drawn by a seven-member commission, under a constitutional amendment approved by voters last November. The commission will be composed of one gubernatorial appointee, two appointees by Republican legislative leaders, two appointees by Democratic legislative leaders and two political independents appointed by majority and minority party legislative leaders. The commission’s recommended maps will be submitted to the Legislature for final approval. Districts shall be compact and contiguous, preserve communities of interest and not favor or disfavor incumbents. Partisan voting records may not be considered.